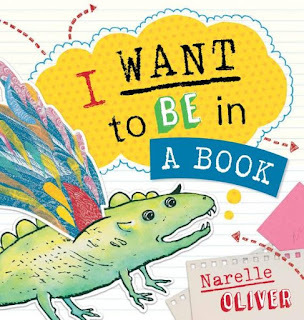 I Want To Be In A Book is a delightful story about Cecil, a little creature who was created by author and illustrator, Narelle Oliver. The book's character Cecil takes readers on an imaginative, adventurous and sometimes dangerous journey to fulfil his dream of becoming part of a book. Cecil felt that he must be a special idea of Narelle Oliver's because she had named him and he was a completed sketch unlike other characters on Narelle's drawing board. Cecil waited. He watched as other characters were created, painted, added to scenes in stories like The Very Blue Thinggmajig and then watch them vanish. Cecil knew that the magic would happen, that the characters would reappear in a brand new book. Cecil dreamed that he could appear in a book too. What would he look like? Who would he be? Where would the story take place? He wished and leapt into an open book, he was in the story High Above the Sea. As he became part of the story giant talons of an Osprey came towards him, he needed to escape. As the page is turned Cecil jumped out of the book and landed onto a story ideas book. Looking at the pages of this new book, Cecil realises that the ideas book was him and his potential stories. Next the reader sees Cecil painted and the magic happens to him just like it did to other Narelle Oliver characters. Narelle's book, I Want To Be In A Book, following the development of a character into a story is conveyed in an adventurous and captivating way. While the story was not quite finished before Narelle's death in 2016, she had completed Cecil's story to the point where it could finalised and published. It would have been so sad to see Cecil's dream of being in a book not realised. The illustrations are bright and dynamic using a wonderful combination of collage, sketches, watercolour paintings, linocuts and photographs to reveal the process of writing and illustrating a book. Teacher notes are available here. Don't Let a Spoonbill in the Kitchen!